As the second year of our narrative campaign comes to a close, the strategic situation for the beleaguered Corvus Cluster remains relatively stable. But that is no cause for complacency. The past year—736.M41 by the Imperial calendar—was witness to numerous battles across such worlds as Hegira, Dar Sai, and Al’gel. Armies clashed, and land was conquered, lost, and recovered. Meanwhile, the navies of various empires fought desperate battles in the vacuum of space. Smaller clashes also occurred—largely unnoticed yet having a significant impact on worlds light years apart. A look at any strategic map of Hegira appears to show a stalemate on the desert mining moon of Sculptor II, with only a minor change in the battle lines near the Iron Spires. That belies the crisis earlier in the year when the orks came close to conquering the moon. On 3 10 736.M41—only 10 days into the new year—the orks seized the Iron Spires in what would prove the fourth battle fought over what may be the dangerous and desolate region of Hegira. 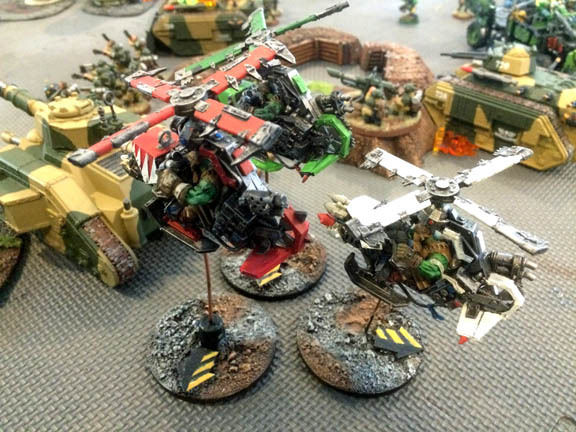 An increasing variety of ork weaponry—Killa Kans, Deff Dreads, and even Deff Koptas—complicated the Imperial defense of Hegira. By now, the heavy casualties suffered by Imperial forces forced civil and military leaders into emergency measures, deploying hastily trained militia and conscript units to the front lines. A new defensive position was set up at the famed Barak Mine, the largest and most strategically important mining complex on the moon. Such efforts were was not enough. On 3 107 736.M41, nearly 30,000 orks—the largest ork military force yet seen on Hegira—attacked. This was a massive battle. Lemon Russ battle tanks traded fire with Deff Dreads, while Trukks overflowing with Boyz, charged the Imperial lines. Overhead, Dakkajets traded fire with Valkyries. At this point, simple logistics turned the tide. Having endured heavy casualties in their march north—and at the end of a long supply line—even the blood-frenzied orks had to stop and regroup before making their final push northward. It was a critical time. For Imperial authorities, the loss of Susa City, as the seat of Imperial authority and the most important supply and manufacturing center on Hegira, would be a devastating blow to public morale. As important, the fall of the capital city would have opened the Palatine Space Port to attack. Scraping together every last man, women, child, and tank, Imperial authorities readied themselves. The lines were bolstered with plascrete defenses, a last-minute reinforcement of tanks, and a new cadre of Skitarii, as well as thousands of conscripts who barely knew how to fire their freshly distributed lasguns. 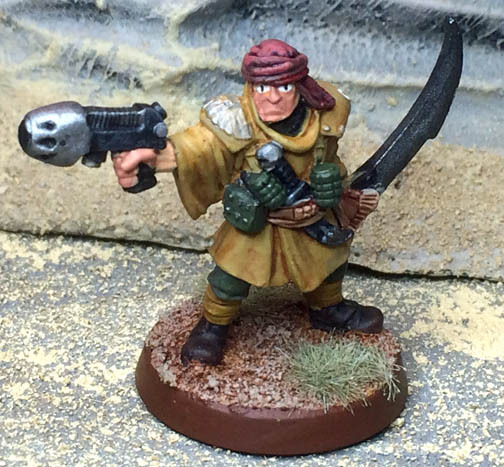 Col. Fakhri Pasha is commander of the 2nd Tallarn Regiment and is respected for leading his troops from the front line. He has perfected the highly mobile tactics that have made the regiment an elite unit. While these battles were taking place, the defenders of the Sculptor System benefited from the arrival of reinforcements. Among them were the 2nd Tallarn Regiment, an elite desert-fighting unit that was deployed to Hegira, and the ancient dreadnought, Boras, who arrived to reinforce the 4th Company of the Knights of Altair, an Adeptus Astartes chapter that is operating in the Corvus Cluster (but whose activities have not been shared by Imperial authorities). Commander Swiftstrike proved a resourceful Tau leader, although the Imperial blockade of Dar Sai has cut his supply line and left him scrambling to conquer a world without reinforcements. Few realize that the Inquisition roams the Corvus Cluster defending the Imperium from xeno threats. Nearly a year after Rogue Trader Adeon Drake was involved in the wakening of the Necrons on Stigmata, the ancient race of cybernetic warriors began to explore beyond the boundaries of their world. Just before the beginning of the year, the security beacons above Stigmata went silent, and an Imperial gunship sent to investigated disappeared. Later in the year (6 598 736.M41), Imperial Navy Task Force Bellum 978 received a distress call from a scientific outpost in the Dryilian System, approximately 75 light years rimward of Belliose III. Soon after, Imperial authorities lost contact with those Imperial ships. It took time for Imperial authorities to put together the pieces, but on 6 649 736.M41, a minor official of the Inquisition, Adonai Drusus, made a request to visit the world of Dryilian to investigate what had happened. (Mystery in the Dryilian System) No word yet on his findings. The Space Marines launched a raid on Media III in a bid to stop Tau weaponry from reaching the beleaguered Yaisdra Subsector, a neighboring region of space. Events outside the Corvus Cluster have made themselves felt over the past year. In a nearby region of space, the Tau have invaded the Yaisdra Subsector. Assault on Yaisdra IX is another narrative campaign being fought in Great Britain, which is collaborating with the Corvus Cluster as our parallel campaigns engage the Tau. Intelligence informed Imperial commanders in the Yaisdra Subsector that key technology was being developed on Media III (in the Sculptor System) that could affect the Imperial defenses of Yaisdra IX. To stop that technology, an Admiral Codleen of Task Force Solaris suggested an interception of that technology before it reached Yaisdra. We have word that the Haruspex may yet rule in Ungoloth, an abandoned hive city of Morkai. We know a small space hulk—possibly the Shard of Damnation—was spotted by a merchant vessel, The Maersk, traversing the Oisan Subsector six weeks ago. Small settlements on several agri-worlds have been raided by Balar Slavers—and Adeon Drake has sworn to bring them to justice. TheGM: Thus ends another year in the Corvus Cluster. I hope this synopsis of 736.M41 helps. It’s certainly interesting to me to see how the “narrative” of our campaign continues to develop in depth and breadth. I can hardly wait to see what will happen this year! The Corvus Cluster is a Warhammer 40K blog documenting our gaming adventures in the sci-fi universe of Games Workshop. Is a Stompa marching on the Tarak Mines?